Pruning grape vines - I believe everyone should grow grape vines. They are truly one of THE most amazing plants. Everything this plant produces is gorgeous – its trunk, the leaves, the clusters, even the canes – they are all just beautiful. In winter when it has no leaves, the beauty of its sculpted trunk is revealed, and at a very specific moment it needs to be pruned. That moment is now, so let’s prune! Note: If you live in an urban environment, and have a porch or balcony, you HAVE TO grow your own grape vine! I don't care how, get yourself a deep planter, or make a hole in the side walk and plant one :-). It may not reach the size of a vineyard, but it doesn't matter, I promise you’ll enjoy it just as much. Find a way. Plant it. And send me a picture J. The following instructions on pruning grapevines refers to the types of grapevines that grow in home gardens (your garden), which is quite different from the king that grow in vineyards. Although, both can be used for same purposes it terms of grapes, one of the most common purposes for growing grapevines is to create shade or a hedge. And of course, there are the grapes. Before pruning grapevines - like any other plant, grapevine too, will always strive to grow. 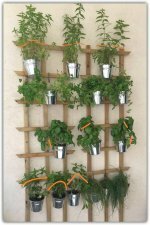 But grapevines are one of the stronger, tougher players, which actually makes them perfect for home garden needs like design, shade or a hedge. The grapevine’s trunk will send its branches and tendrils anywhere and everywhere, so what you need to do is to be its guide. Show it you’re the boss. Demonstrate personality and charisma J and your grapevine will follow you, growing wherever you would like it to. The beautiful trunk in the picture is a classic grapevine. It covers the entrance of a friend’s house and is used for shade. Getting it to do that was easy. When it was still a young plant (6 years ago), with only one branch, we drew a string from the edge of the branch to the roof top... and that’s where it grew, right up to the roof, around the entrance (more string and guidance) and back down again. 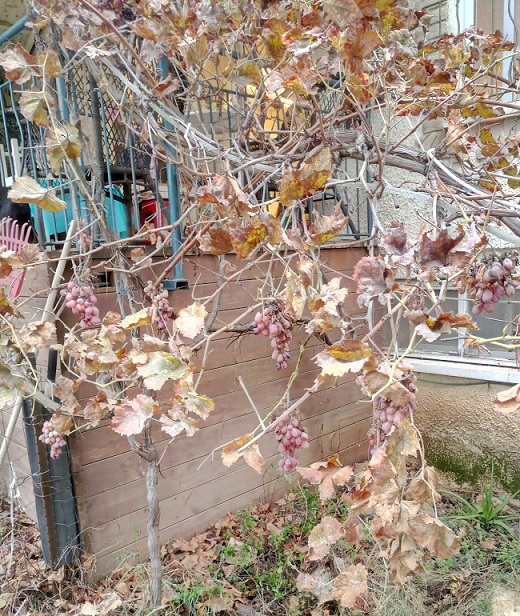 Let’s talk about the tasty part of this plant – grapes!! Most grapevines will produce clusters from day one, but my advice is to wait 2 - 3 years before picking its fruits. In the first 2 - 3 years the plant needs to establish its roots and gain strength. It’s not a must, but if you’re patient with the fruit picking, it will be well worth your while in the future. To get this image, of the clean trunk, we pruned every new branch that tried to grow along the main branch, or soon to be trunk. By doing so, we moved all the energy up the plant. And the trunk remained clean. When to prune? generally speaking you can prune almost all year round, it really depends on what you’re trying to achieve. Let me explain, (and keep in mind that we’re not talking about growing or pruning grapevines in a vineyard), in order to get the most impact in terms of new growth, the best time for pruning grapevines is just before dormancy ends, a few weeks after the last frost, or seconds before the ground gets warmer. I can't tell you the exact temperatures, but even you prune two weeks before, or a few weeks after, it’s no drama. Rest assured, after only one season, as soon as you start to feel the gardener in you tingle - it will be accurate. I have never used gauges to measure the temperature or moisture of the ground. I just pruned and learned. 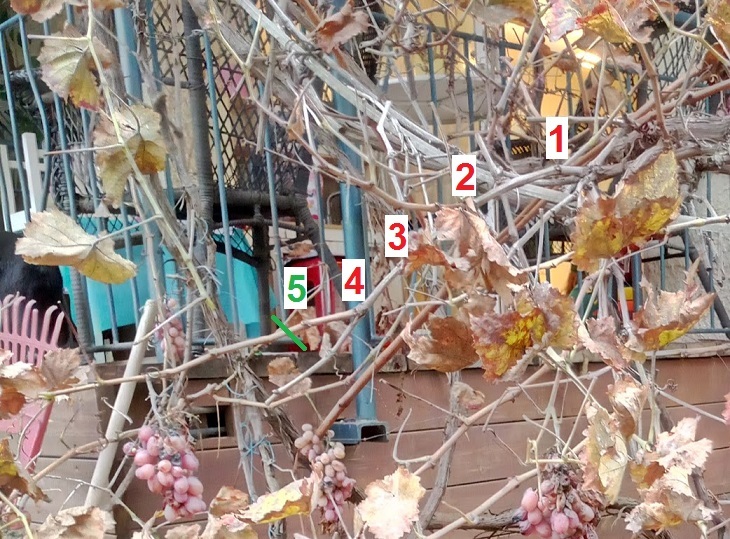 Take a look at this next picture, here you can clearly see that it’s too early to prune, many of the leaves have not fallen, and there are still grape clusters on the plant. It could be pruned, but the impact won’t be the same. Pruning grapevines in early winter wouldn’t cause any harm, but it could confuse the plant. In some areas of the world, growers prune their vineyards from early winter through to very early spring – but that’s when they have to cover many acres and thousands of plants – I’m guessing that’s not the case in your home garden… it certainly isn’t in mine J. Start by pruning and removing all the gray branches. After they are all gone, the BIG MESS will be gone​ and you will get a clear view of your vine, which will make it easier to move on. 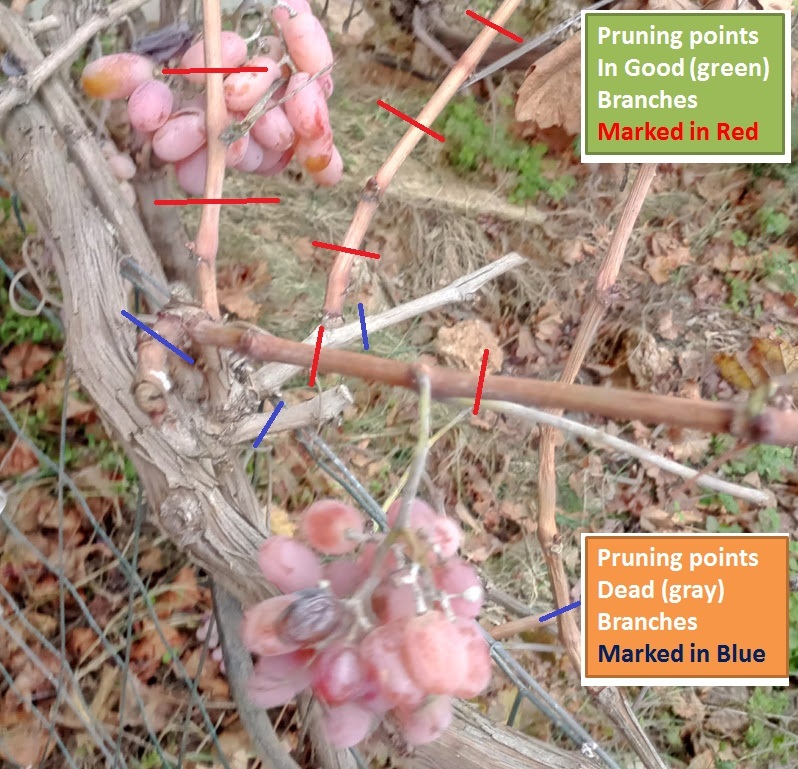 Where prune the dead branches exactly: When pruning grapevines, like many other plants, simply follow the branch to the point where it begins to grow on stem. Once you’ve found the point where it connects to the main trunk, climb half and inch back up the branch and cut. That's it. Repeat for all the dead gray branches and you’re well on your way. Where should i prune ? Pruning grapevines green and brown branches get the same treatment as they gray ones. Choose a green or brown branch, follow it with your eyes until you reach the main stem, just like in the picture where you can see the brown branch meets the woody stem. Prune a few millimeters above the bud. The reason I marked two buds on the branch is because that’s what you will see to. You will come across many buds along the branch, and you will need to choose above which bud to prune. 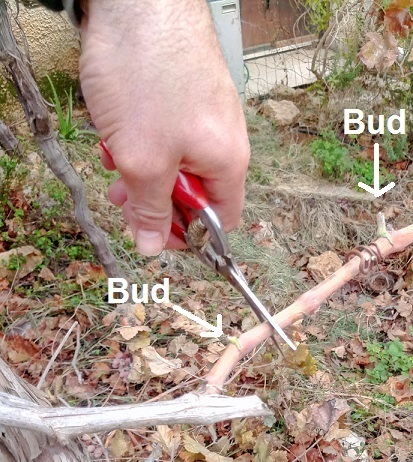 The bud closest to your pruning point will produce the best quality fruit and branches. That's how it works! Plants will always send most of their energy for renewal to the nearest cutting point. Great progress!! You keep pruning and I’ll show you what you should be looking for after each pruning session. What to look for after you prune? So you’ve scanned for a green or brown branch, you’ve chosen a bud, and you’ve pruned above it, Now, before you move on and make another next cut, take a look at the inner part of the branch you’ve just pruned. If you pruned a dead branch, or a twig, it probably won’t affect the future growth of the vine. What you see in the picture is what you’re looking for. 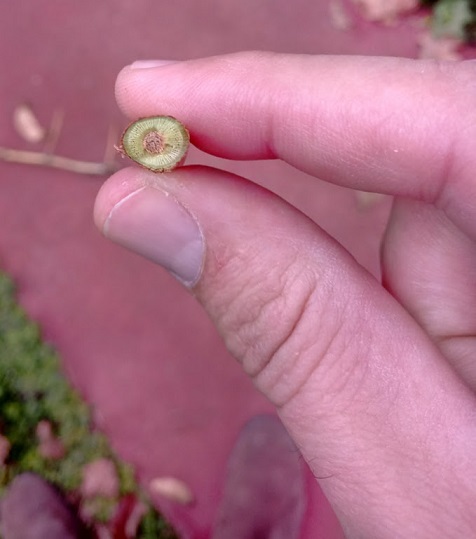 A round brown spot in the center of a fresh green stem. That's what it should look like after pruning. It’s how you'll know that the branch is alive, in good shape and ready to deliver. 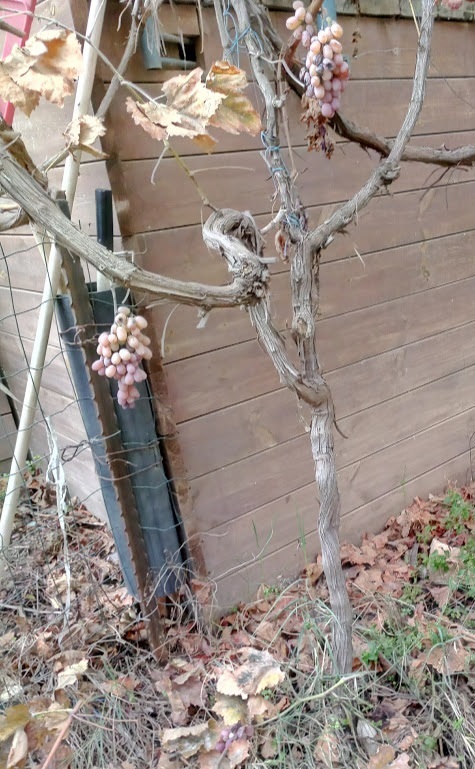 Can I prune my grapevine in the summer? Sure, summer pruning is less effective. Mostly because you just can't see what's going on threw the tangle of branches. 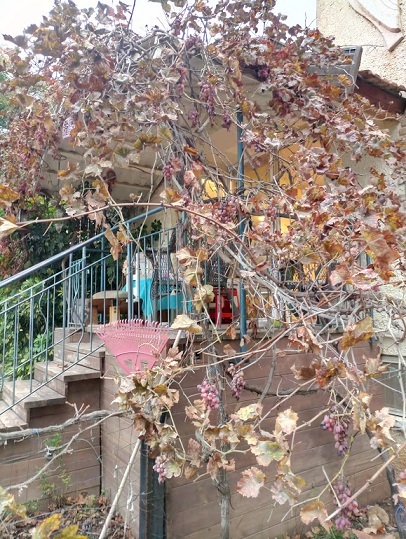 You have already done the hard pruning in winter, and what you should prune is only the long branches that interrupt your view, or if your veranda has become so shaded, that you want to let a little sunlight through. Go ahead – feel free to prune in summer. O.K, but what about the fruit? The grape clusters? Much like with roses, there is much discussion over the precise place to prune to get the best results. So, to get the best fruits, trends of the last few years say you should prune above the fifth ‘Eye’ or bud. As you can see in the picture, count five buds from the main trunk and prune just above the fifth. If you’ve done it differently don’t stress - you'll get fruits even if you've pruned above the first bud. But the latest expert opinions in regards to grapes, says the fifth bud is the best. Like I always say, just try it! Prune a few branches above the second eye and few above the fifth and find out for yourself. Summery - Pruning grapevines only looks complicated, but it’s not. In fact, grapevines are such strong plants that you really need a very special talent to damage it. Don't be afraid to cut, try different pruning spots, try different branches throughout the season, explore your plant and learn all about its fabulous patterns. I love playing like that. It’s fun and exciting, and I always get some kind of nice surprise. Just be warned, pruning grape vines is quite addictive. For the grapevine "challenge" I suggest using bypass pruners. Grapevine stems and branches will require a very strong, sharp pairs, which is why I would choose short blades. Maybe in the summer it would be O.K to use a more ‘gentle’ pair, for the softer green stems. But when you’re doing heavy work, you need heavy duty tools.